Here are some new linen creations that are available in my shop. The two above are made from 100% linen in a natural color. Both have flaps made from ultrasuede and are adorned by vintage buttons made from vegetable ivory. The Saddlebagis part of my new collection of handbags for the spring and summer. The design was inspired by the shape of a classic saddlebag. The example above is made from cotton duck fabric with an ultrasuede flap adorned by three green vintage buttons made from the tagua nut. 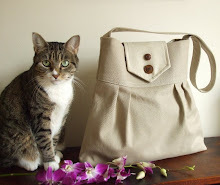 You can find the Saddlebag and other designs in my shop Pesky Cat Designs. The Pesky Cat has been busy creating a new handbag design, The Saddlebag, whose shape is inspired by a classic saddlebag. As you can see she is pretty exhausted. It will be available in my shop, Pesky Cat Designs, later on this afternoon. Check it out! Yesterday was Memorial Day, a United States Federal Holiday observed on the last Monday of May that commemorates U.S. men and women who perished while in military service to their country. Tom, my partner, and I took an early morning walk through the city and it was so pleasant. The streets were quite empty since many people were away for the holiday. Everything seemed so peaceful and serene. New York City, where we live, is bustling most of the time and walks can sometimes be more stressful than relaxing. Last week I finally splurged by purchasing the Grass B and W Cape Cod skirt by A Liaison and have never looked back. It's absolutely beautiful, even better than the photos and it fits like it was custom made for me. A Liaison is a collaboration between Textiles and Fine Art Photography in which digital images are transfered onto fabric to create the most amazing functional art pieces. 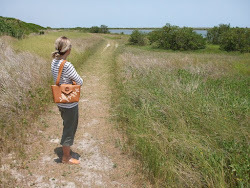 Having the Cape Cod skirt bookmarked on my computer, I found myself viewing it almost once a day for weeks but since it was a bit pricey I hesitated making the next step in purchasing it. Well, it was worth every penny I paid! Last Saturday my latest design, the Downtown Bag, was featured on Etsy's front page. I got a lot of traffic and feedback on my website. Thanks Etsy and candygragz! The Downtown Bag is part of my collection of new designs for the spring and summer. Downtown Bag is a perfect size for everyday use and has four pockets, two interior and two exterior, to keep your things organized. I've adorned the one pictured below with three lovely vintage buttons purchased from ArtsFarm that are made from vegetable ivory , also known as corozo, a name for the tagua nut found in the South American rain forest. Both humanitarians and environmentalists appreciate its use, says Wikipedia. Posted above is a custom order handbag that sold to a lovely person living in Seattle, WA. She wanted me to incorporate design elements from several different handbags from my shop to create her item. The applique of daisies was a new request. After some research on the the internet and some alchemy, I came up with a silhouette design that I was quite pleased with. I was happy to hear that the customer was pleased as well! Below are some of my favorite shops on Etsy's website. Thanks to Etsy's website I've sold handbags all around the world. Below are some handbags that sold to customers living in Canada, the Middle East and Europe.